Khartoum: Protests erupted in Sudan in December over a hike in bread prices have escalated into nationwide demonstrations demanding that President Omar Al Bashir end his 30-year grip on power. Hundreds take to the streets in central Atbara and other cities on December 19 to protest the government’s tripling of bread prices after a three-week shortage and amid steep inflation. Food price hikes had already provoked sporadic demonstrations in January 2018 but were swiftly curbed. New protests erupt the same day as the main opposition leader — ex-prime minister Sadiq Al Mahdi who was driven out in Bashir’s 1989 coup — returns from exile. Some protesters chant “No to hunger”; in Atbra they set fire to the headquarters of Al Bashir’s National Congress Party (NCP). The protests spread to Khartoum and other cities on December 20, demonstrators chanting “freedom, peace, justice” and calling for “the fall of the regime”. Clashes break out as police try to disperse the crowds and eight demonstrators are killed. Other NCP offices are torched. Troops are deployed in Khartoum and other cities. On the sixth day of demonstrations, Al Bashir breaks his silence on December 24 and vows “real reforms”. Western powers on January 17 call on Sudan to respect the rights of demonstrators. The following week the media accreditation of several Sudanese journalists working for foreign outlets is withdrawn. On February 11, Human Rights Watch releases videos documenting violence by security forces against protesters including live fire, tear gas and beatings. Ten days later, security agents arrest several opposition activists as protesters try to march on the presidential palace. 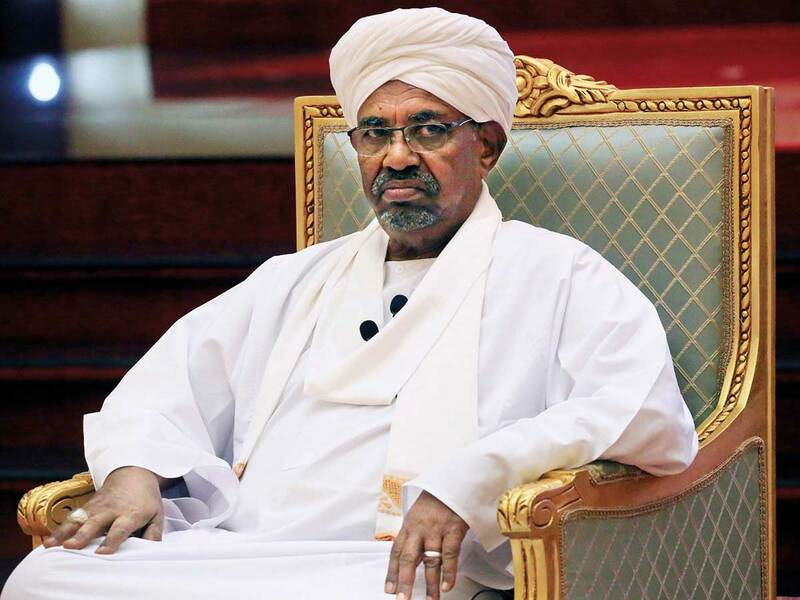 Al Bashir declares a nationwide year-long state of emergency on February 22, also dissolving the federal and provincial governments and appointing army and intelligence officers as provincial governors. Two days later, he swears in a new prime minister as riot police confront hundreds calling for him to resign. On March 1, Al Bashir hands his powers as chief of the ruling NCP to his deputy. 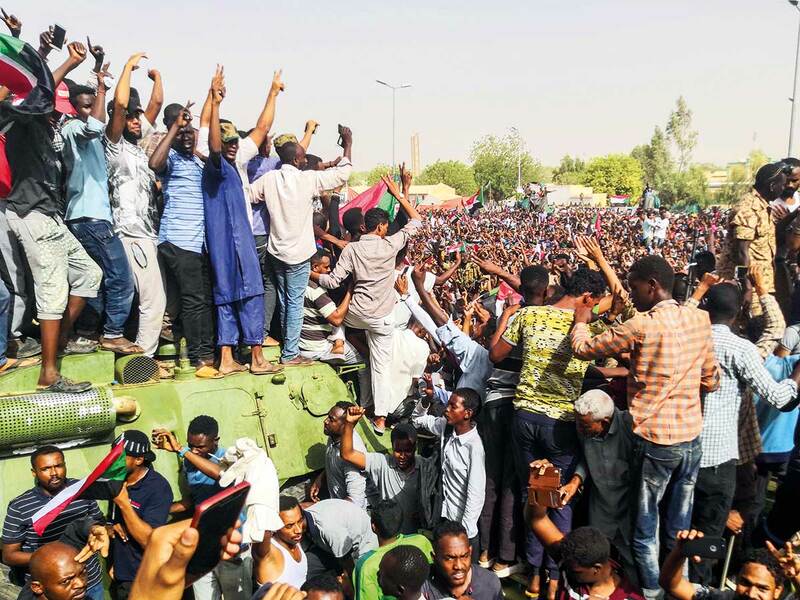 The protests become less regular after the state of emergency and Al Bashir on April 4 acknowledges that demonstrators had “legitimate” economic concerns, calling for dialogue. 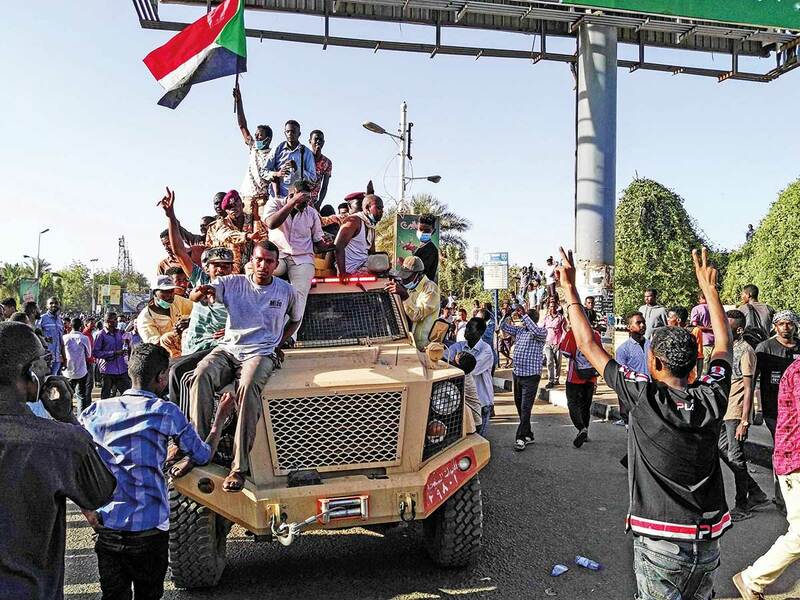 But on April 6, thousands march again in Khartoum, gathering for the first time outside the military headquarters and chanting “One Army, One People”. They set up camp at the complex, which also houses the president’s residence, defying attempts by security forces on April 9 to dislodge their sit-in with tear gas and gunshots into the air. The United States, Britain and Norway call the same day on the Sudanese authorities to deliver a plan for “political transition”. Sudan’s police orders its forces to avoid intervening against protesters, following the policy of non-intervention by the military. On April 9, a Sudanese woman garbed in a white “thobe”, and wearing circular gold earrings took social media by storm. 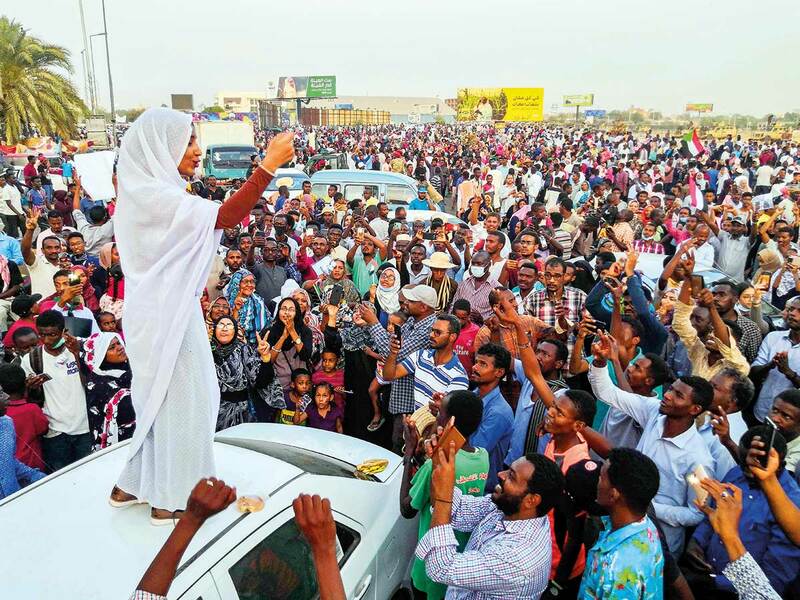 She was seen in videos mounted on car rooftops and on a stage chanting slogans and singing traditional songs calling for change in Sudan. “I hope our revolution will achieve its goal,” said Alaa Salah, dubbed the protest movement’s “Nubian queen”.